Well, it hasn’t quite been a week since the challenge started. I was excited to start our regular walking routine (well…kind of….it’s more like “committed”) so we actually started the challenge a day early with a 30-minute walk on New Years Eve. When we got back from our walk, Chester and Gretel were zooming around like crazy! I am sure they can handle more than a 30-miute walk a day (but this is a good start for us). Their behavior seems to have more to do with the proximity to food time than anything. I find that if we come back within a hour or two of dinner time I get zoomies and in-your-face pestering until I feed them. This is annoying so I am holding out hope that 1) eventually they will figure out that walkies and dinner time and mutually exclusive and 2) as we move along in the challenge they will get more and more tired from the regular walks and calm down. I think I am being delusional in both cases. We started the first official day of the challenge off with a bang. 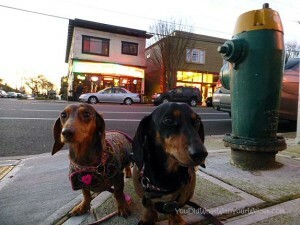 Our Dachshund friends Rufus and Porter and their Mom came over to support our efforts. We ended up walking around our local lake for an hour. They actually walked even longer because it takes them about a half hour to walk to our house and back! 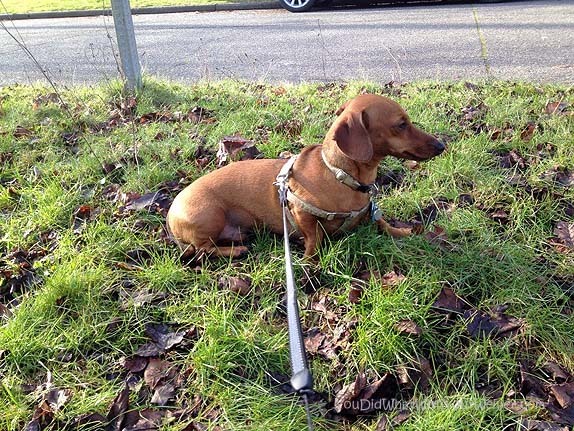 Apparently on their way back home Rufus pulled a typical Dachshund move and said he was done by firmly planting himself in the grass and refusing to move (he did, in fact, start to move a minute later though). Yesterday wasn’t so pleasant. Because I am insane, I took two Flywheel spin classes by 1 pm. All I wanted to do was go home and take a nap on the couch. You would think I would have started trying to make excuses then. Nope! I waited until I actually got home and headed out for our 3o minute walk. It was then that the excuses (or rather cheating ideas and justifications) started rolling in. 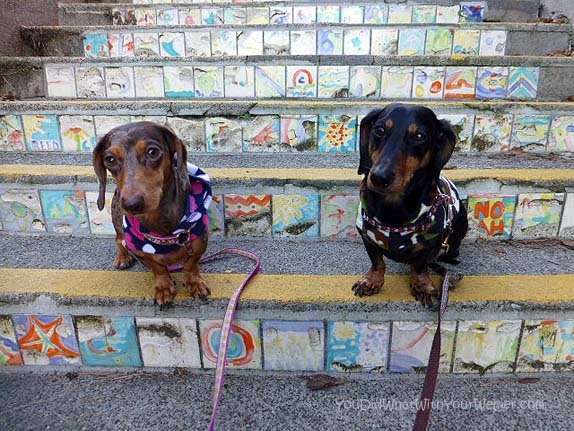 We stopped by some of my favorite neighborhood stairs to take a few pictures. It took about 5 minutes. I thought well, hey, maybe we only had to walk 25 minutes because were were ON our walk and outside when we took the pictures. I didn’t give in to that line of thought though and still committed to WALKING the whole 30 minutes. Then I thought I could make the time go faster if I called my step-Dad. He is usually good for at least a 20 minute conversation. Nope. He wasn’t home. Chester and Gretel didn’t make any excuses. Of course, all they did was sleep all morning but it drove a good point home. Us humans have busy lives and a lot of things competing for our time. It is really easy to do, do, do until things like walking for 30 minutes get squeezed out. It’s easy to put others needs before ours and forget to take time to do things for ourselves. Us humans are complicated. Dogs just want to walk…no excuses. It really helps that we have had great walking weather so far. It has been super cold but the sun has been shining. 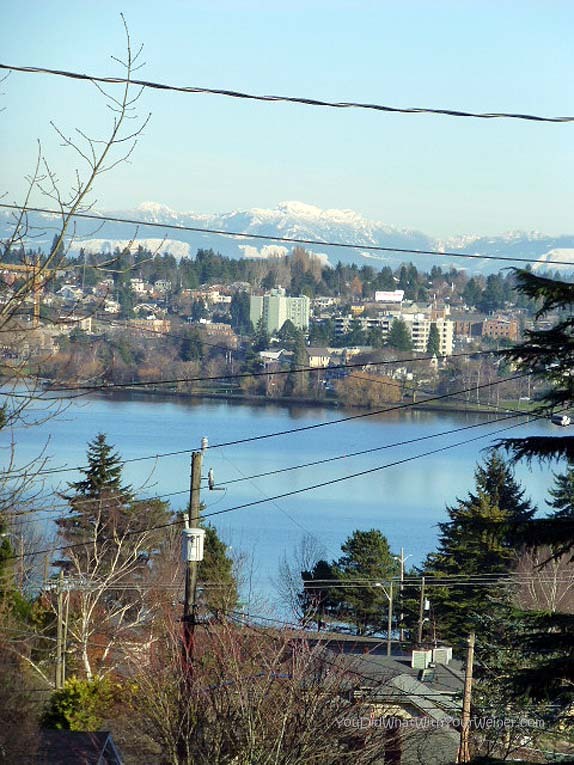 Our view from the top of the hill behind our house is pretty inspiring on a good day. A million more people have joined us in the challenge since I published the initial roster. Well, ok, not a million but enough that I have lost count. I am going to attempt to update the list this afternoon. If you are a blogger joining us and writing your own update posts, don’t forget to post a link to it on our Facebook page so we can find it. I have to confess that we took yesterday off. In part because of Rufus’s reaction in the above photo, in part because his harness is rubbing his hair off in a spot and I want it to grow back, and in part because I just didn’t want to. 🙂 However, Rufus initiated a game of fetch with me yesterday evening which is pretty unusual, so I think he missed his walkies. Very good. You’re right, dogs just want to go. Period. I have to say, since we are in St. George now, walking is much more pleasant. It’s still chilly here….but sunny. Wow! With views like that, we’d be walking all the time! We’ve done a great job at the 30 minutes per day so far, but finding time to post about it on my blog has been more of a challenge. And my IT staff lacks Gizmo’s technical expertise to make a cool graphic to show our progress. I (quietly) decided to undertake this challenge – but then our Australian summer kicked in! It got to 45C (113F) yesterday! It’s ‘nicer’ today, only 33C (91F), but this is the only relief we get, with it forecast to be 36C (97F) and higher for the next week. So maybe I’ll commit to the challenge in Autumn. Phew! Ha ha! Dolly does the sit down move too! It drives me nuts! It took a lot of treats & work to get her to improve she does it occasionally if I am moving too fast for her nose! What a great start I am so proud of you! Our walks are so much more boring just to the park and back. I did try some new locations over the summer as I was getting bored so I figured Dolly was too. I had ny 2 hours today but not a squiggle in sight. The park is the Somme and I have trench paw. The rain just keeps on coming. Oh well paws crossed for vermin to chase tomorrow. You should email your steps pics to George The Lad Saturday Steps. I have not got the link to hand but it comes up in Google. He will put in on his Saturday feature. Have a super Saturday. Flywheel spin classes…2 of ’em? YIKES! LOL Y-Bo, my dog, and I are enjoying this 30/30 challenge. We’ve been lucky with weather too. So glad you came up with the idea, Jess. Happy Saturday. I am happy to have the challenge to motivate me and so many bloggy friends taking it themselves. It admit it has been a bit of a mental struggle for me but hopefully by the end of the month it will feel like our regular routine. Great job, keep it up. Mom’s rule is no phoning unless it is an emergency on our walks. She wants to fully tune into us and what is going on around us. Happy Walking! You guys are walking SUPERSTARS! We’ve been out almost everyday. We’re not doing quite as well. :0( We had to call two nights this week on account of thick fog. With two black dogs, I was reluctant to walk when I could only see 2 ft. in front of us – I couldn’t even see to the end of the leash! We have a plan afoot to make up the lost time during daylight hours tomorrow. That is definitely a gorgeous view and would help inspire me to get out there. We used to be able to see the ocean from our house but since we moved there are too many other houses in the way. It makes for a much more boring walk, especially this time of year when it’s dark the whole time. Good on you for sticking with it despite whatever else you’ve endured during your day. I am curious to find out if it will deepen your relationship with your dogs the same way it did mine. What a fab view! Keep up the good work!